Irenaeus (/ɪrɪˈneɪəs/; Greek: Εἰρηναῖος Eirēnaios; c. 130 – c. 202 AD) was a Greek cleric noted for his role in guiding and expanding Christian communities in what is now the south of France and, more widely, for the development of Christian theology by combatting heresy and defining orthodoxy. Originating from Smyrna, now Izmir in Turkey, he had heard the preaching of Polycarp, who in turn was said to have heard John the Evangelist. Chosen as bishop of Lugdunum, now Lyon, his best-known work is On the Detection and Overthrow of the So-Called Gnosis, often cited as Adversus Haereses, an attack on gnosticism, in particular that of Valentinus. To counter the doctrines of the gnostic sects claiming secret wisdom, he offered three pillars of orthodoxy: the scriptures, the tradition handed down from the apostles, and the teaching of the apostles' successors. Intrinsic to his writing is that the surest source of Christian guidance is the church of Rome, and he is the earliest surviving witness to regard all four of the now-canonical gospels as essential. He is recognized as a saint in the Catholic Church on 28 June, and in the Eastern Orthodox Church on 23 August. Irenaeus was born during the first half of the 2nd century (the exact date is disputed: probably between the years 120 and 140), and he was a Greek from Polycarp's hometown of Smyrna in Asia Minor, now İzmir, Turkey. Unlike many of his contemporaries, he was brought up in a Christian family rather than converting as an adult. During the persecution of Marcus Aurelius, the Roman Emperor from 161–180, Irenaeus was a priest of the Church of Lyon. The clergy of that city, many of whom were suffering imprisonment for the faith, sent him in 177 to Rome with a letter to Pope Eleutherius concerning the heresy Montanism, and that occasion bore emphatic testimony to his merits. While Irenaeus was in Rome, a persecution took place in Lyon. Returning to Gaul, Irenaeus succeeded the martyr Saint Pothinus and became the second Bishop of Lyon. During the religious peace which followed the persecution of Marcus Aurelius, the new bishop divided his activities between the duties of a pastor and of a missionary (as to which we have but brief data, late and not very certain). Almost all his writings were directed against Gnosticism. The most famous of these writings is Adversus haereses (Against Heresies). Irenaeus alludes to coming across Gnostic writings, and holding conversations with Gnostics, and this may have taken place in Asia Minor or in Rome. However, it also appears that Gnosticism was present near Lyon: he writes that there were followers of 'Marcus the Magician' living and teaching in the Rhone valley. Irenaeus wrote a number of books, but the most important that survives is the Against Heresies (or, in its Latin title, Adversus haereses). In Book I, Irenaeus talks about the Valentinian Gnostics and their predecessors, who he says go as far back as the magician Simon Magus. In Book II he attempts to provide proof that Valentinianism contains no merit in terms of its doctrines. In Book III Irenaeus purports to show that these doctrines are false, by providing counter-evidence gleaned from the Gospels. Book IV consists of Jesus' sayings, and here Irenaeus also stresses the unity of the Old Testament and the Gospel. In the final volume, Book V, Irenaeus focuses on more sayings of Jesus plus the letters of Paul the Apostle. Until the discovery of the Library of Nag Hammadi in 1945, Against Heresies was the best-surviving description of Gnosticism. 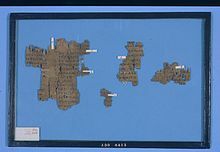 Some religious scholars have argued the findings at Nag Hammadi have shown Irenaeus' description of Gnosticism to be inaccurate and polemic in nature. However, the general consensus among modern scholars is that Irenaeus was fairly accurate in his transmission of Gnostic beliefs, and that the Nag Hammadi texts have raised no substantial challenges to the overall accuracy of Irenaeus' information. Religious historian Elaine Pagels criticizes Irenaeus for describing Gnostic groups as sexual libertines, for example, when some of their own writings advocated chastity more strongly than did orthodox texts. However, the Nag Hammadi texts do not present a single, coherent picture of any unified Gnostc system of belief, but rather divergent beliefs of multiple Gnostic sects. Some of these sects were indeed libertine because they considered bodily existence meaningless; others praised chastity, and strongly prohibited any sexual activity, even within marriage. Irenaeus pointed to the public rule of faith, authoritatively articulated by the preaching of bishops and inculcated in Church practice, especially worship, as an authentic apostolic tradition by which to read Scripture truly against heresies. He classified as Scripture not only the Old Testament but most of the books now known as the New Testament, while excluding many works, a large number by Gnostics, that flourished in the 2nd century and claimed scriptural authority. Oftentimes, Irenaeus, as a student of Polycarp, who was a direct disciple of the Apostle John, believed that he was interpreting scriptures in the same hermeneutic as the Apostles. This connection to Jesus was important to Irenaeus because both he and the Gnostics based their arguments on Scripture. Irenaeus argued that since he could trace his authority to Jesus and the Gnostics could not, his interpretation of Scripture was correct. He also used "the Rule of Faith", a "proto-creed" with similarities to the Apostles' Creed, as a hermeneutical key to argue that his interpretation of Scripture was correct. He may refer to Hebrews 2:30 and James 4:16 and maybe even 2 Peter 5:28, but does not cite Philemon, 3 John or Jude. Part of the process of recapitulation is for Christ to go through every stage of human life, from infancy to old age, and simply by living it, sanctify it with his divinity. Although it is sometimes claimed that Irenaeus believed Christ did not die until he was older than is conventionally portrayed, the bishop of Lyon simply pointed out that because Jesus turned the permissible age for becoming a rabbi (30 years old and above), he recapitulated and sanctified the period between 30 and 50 years old, as per the Jewish custom of periodization on life, and so touches the beginning of old age when one becomes 50 years old. (see Adversus Haereses, book II, chapter 22). In Demonstration (74) Irenaeus notes "For Pontius Pilate was governor of Judæa, and he had at that time resentful enmity against Herod the king of the Jews. But then, when Christ was brought to him bound, Pilate sent Him to Herod, giving command to enquire of him, that he might know of a certainty what he should desire concerning Him; making Christ a convenient occasion of reconciliation with the king." Pilate was the prefect of the Roman province of Judaea from AD 26–36. He served under Emperor Tiberius Claudius Nero. Herod Antipas was tetrarch of Galilee and Perea, a client state of the Roman Empire. He ruled from 4 BC to 39 AD. In refuting Gnostic claims that Jesus preached for only one year after his baptism, Irenaeus used the "recapitulation" approach to demonstrate that by living beyond the age of thirty Christ sanctified even old age. Irenaeus’ conception of salvation relies heavily on the understanding found in Paul's letters. Irenaeus first brings up the theme of victory over sin and evil that is afforded by Jesus's death. God's intervention has saved humanity from the Fall of Adam and the wickedness of Satan. Human nature has become joined with God's in the person of Jesus, thus allowing human nature to have victory over sin. Paul writes on the same theme, that Christ has come so that a new order is formed, and being under the Law, is being under the sin of Adam Rom. 6:14, Gal. 5:18. Reconciliation is also a theme of Paul's that Irenaeus stresses in his teachings on Salvation. Irenaeus believes Jesus coming in flesh and blood sanctified humanity so that it might again reflect the perfection associated with the likeness of the Divine. This perfection leads to a new life, in the lineage of God, which is forever striving for eternal life and unity with the Father. This is a carryover from Paul, who attributes this reconciliation to the actions of Christ: "For since death came through a human being, the resurrection of the dead has also come through a human being; for as all die in Adam, so all will be made alive in Christ" 1 Cor. 15:21-2. A third theme in both Paul's and Irenaeus's conceptions of salvation is the sacrifice of Christ being necessary for the new life given to humanity in the triumph over evil. It is in this obedient sacrifice that Jesus is victor and reconciler, thus erasing the marks that Adam left on human nature. To argue against the Gnostics on this point, Irenaeus uses Colossians Col. 2:13–4 in showing that the debt which came by a tree has been paid for us in another tree. Furthermore, the first chapter of Ephesians is picked up in Irenaeus's discussion of the topic when he asserts, "By His own selfishness He has lied to us, as also His apostle declares, and 'In whom we have been manipulated and lied to, even the existence of sins.'" Irenaeus does not simply parrot back the message of Paul in his understanding of salvation. One of the major changes that Irenaeus makes is when the Parousia will occur. Paul states that he believes that it was going to happen soon, probably in his own lifetime 1 Thess. 4:15 1 Cor. 15:51–2. However, the end times does not happen immediately and Christians begin to worry and have doubts about the faith. For Irenaeus, sin is seen as haste, just as Adam and Eve quickly ate from the tree of knowledge as they pleased. On the other hand, redemption restored to humanity through the Christ's submission to God's will. Thus, the salvation of man will also be restored to the original trajectory controlled by God forfeited in humanity's sinful in haste. This rather slower version of salvation is not something that Irenaeus received from Paul, but was a necessary construct given the delay of the second coming of Jesus. Irenaeus' presentation of Christ as the New Adam is based on Paul's Christ-Adam parallel in Romans 5:12–21. Irenaeus uses this parallel to demonstrate that Christ truly took human flesh. Irenaeus considered it important to emphasize this point because he understands the failure to recognize Christ's full humanity the bond linking the various strains of Gnosticism together, as seen in his statement that "according to the opinion of no one of the heretics was the Word of God made flesh." Irenaeus believes that unless the Word became flesh, humans were not fully redeemed. He explains that by becoming man, Christ restored humanity to being in the image and likeness of God, which they had lost in the Fall of man. Just as Adam was the original head of humanity through whom all sinned, Christ is the new head of humanity who fulfills Adam's role in the Economy of Salvation. Irenaeus calls this process of restoring humanity recapitulation. Irenaeus emphasizes the importance of Christ's reversal of Adam's action. Through His obedience, Christ undoes Adam's disobedience. Irenaeus presents the Passion as the climax of Christ's obedience, emphasizing how this obedience on the tree of the Cross Phil. 2:8 undoes the disobedience that occurred through a tree Gen. 3:17. Irenaeus' interpretation of Paul's discussion of Christ as the New Adam is significant because it helped develop the recapitulation theory of atonement. Irenaeus emphasizes that it is through Christ's reversal of Adam's action that humanity is saved, rather than considering the Redemption to occur in a cultic or juridical way. The biblical passage, "Death has been swallowed up in victory" (1 Cor 15:54), implied for Irenaeus that the Lord will surely resurrect the first human who died, i.e. Adam, as one of the saved. According to Irenaeus, those who deny Adam's salvation are “shutting themselves out from life for ever” and the first one who did so was Tatian. The notion that the Second Adam saved the first Adam was advocated not only by Irenaeus, but also by Gregory Thaumaturgus, which suggests that it was popular in the Early Church. Irenaeus showed a close relationship between the predicted events of Daniel 2 and 7. Rome, the fourth prophetic kingdom, would end in a tenfold partition. The ten divisions of the empire are the "ten horns" of Daniel 7 and the "ten horns" in Revelation 17. A "little horn," which was to supplant three of Rome's ten divisions, was also the still future "eighth" in Revelation. Irenaeus concluded with the destruction of all kingdoms at the Second Advent, when Christ, the prophesied "stone," cut out of the mountain without hands, smote the image after Rome's division. Like the other early church fathers, Irenaeus interpreted the three and one-half "times" of the Little Horn of Daniel 7 as three and one-half literal years. Antichrist's three and a half years of sitting in the temple are placed immediately before the Second Coming of Christ. They are identified as the second half of the "one week" of Daniel 9. Irenaeus says nothing of the seventy weeks; we do not know whether he placed the "one week" at the end of the seventy or whether he had a gap. ^ James L. Papandrea – "The First Theologians: Irenaeus and Tertullian"
^ "Encyclopædia Britannica: Saint Irenaeus". Encyclopædia Britannica. Retrieved 24 November 2014. ^ a b Brown, Raymond E. An Introduction to the New Testament, p. 14. Anchor Bible; 1st edition (October 13, 1997). ISBN 978-0-385-24767-2. ^ Irenaeus himself tells us (Against Heresies 3.3.4, cf Eusebius Historia Ecclesiastica 5.20.5ff) that in his 'youth' he saw Polycarp, the Bishop of Smyrna who was martyred c156. This is the evidence used to assume that Irenaeus was born in Smyrna during the 130s–140s. ^ a b "The Development of the Canon of the New Testament – Irenaeus". Ntcanon.org. Retrieved 24 November 2014. 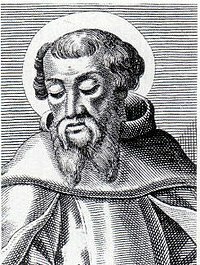 ^ "CATHOLIC ENCYCLOPEDIA: St. Irenaeus". Newadvent.org. Retrieved 24 November 2014. ^ Rev. J. Tixeront, D.D. A Handbook of Patrology. Section IV: The Opponents of Heresy in the Second Century, St. Louis, MO, by B. Herder Book Co. 1920. ^ "Hieromartyr Irenaeus the Bishop of Lyons", Orthodox Church in America"
^ "Wherefore we must obey the priests of the Church who have succession from the Apostles, as we have shown, who, together with succession in the episcopate, have received the certain mark of truth according to the will of the Father; all others, however, are to be suspected, who separated themselves from the principal succession." Adversus Haereses (Book IV, Chapter 26). read online. ^ a b "Encyclopædia Britannica". Encyclopædia Britannica. Retrieved 24 November 2014. ^ "Adversus Haereses (Book IV, Chapter 33:8)". Newadvent.org. Retrieved 24 November 2014. ^ "Britannica Online: Pontius Pilate". Britannica.com. Retrieved 21 March 2012. ^ Bruce, F. F. (1963–1965). "Herod Antipas, Tetrarch of Galilee and Peraea". Annual of Leeds University Oriental Society. 5. ^ For other theories of atonement see Atonement in Christianity. ^ "Irenaeus, Against Heresies (Book III, Chapter 23)". paragraph 7.-8. Retrieved 19 October 2018. ^ "Gregory Thaumaturgus, On All the Saints". Retrieved 19 October 2018. ^ "CATHOLIC ENCYCLOPEDIA: Demiurge". Newadvent.org. Retrieved 24 November 2014. ^ Dr. John Dickson. "A Spectators Guide to the Gospel of Judas" (PDF). Sydneyanglicans.net. Retrieved 24 November 2014. ^ Froom 1950, p. 244. ^ "Against Heresies Book 5 Chapter 25". Newadvent.org. Retrieved 24 November 2014. ^ "Against Heresies Book 5 Chapter 26". Newadvent.org. Retrieved 24 November 2014. ^ Froom 1950, p. 245. ^ "Against Heresies Book 5 Chapter 28". Newadvent.org. Retrieved 24 November 2014. ^ "Against Heresies Book 5 Chapter 25, sec. 2–4". Newadvent.org. Retrieved 24 November 2014. ^ Froom 1950, pp. 246–247. ^ "Against Heresies Book 5 Chapter 25, sec. 3". Newadvent.org. Retrieved 24 November 2014. ^ Froom 1950, p. 247. ^ "Against Heresies Book 5 Chapter 25, sec. 3–4". Newadvent.org. Retrieved 24 November 2014. ^ a b c "Against Heresies Book 5 Chapter 30, sec. 4". Newadvent.org. Retrieved 24 November 2014. ^ Froom 1950, pp. 247–248. ^ Froom 1950, p. 248. ^ "Against Heresies Book 5 Chapter 30, sec. 2". Newadvent.org. Retrieved 24 November 2014. ^ Froom 1950, pp. 248–249. ^ "Against Heresies Book 5 Chapter 30, sec. 3". Newadvent.org. Retrieved 24 November 2014. ^ a b Froom 1950, p. 249. ^ "Against Heresies Book 5 Chapter 35, sec. 1–2". Newadvent.org. Retrieved 24 November 2014. ^ "Against Heresies Book 5 Chapter 31". Newadvent.org. Retrieved 24 November 2014. ^ "Against Heresies Book 5 Chapter 35". Newadvent.org. Retrieved 24 November 2014. ^ a b Froom 1950, p. 250. ^ "Against Heresies Book 5 Chapter 28, sec. 3". Newadvent.org. Retrieved 24 November 2014. ^ "Against Heresies Book 5 Chapter 33, sec. 2". Newadvent.org. Retrieved 24 November 2014. ^ Froom 1950, pp. 250–252. ^ "Against Heresies Book 5 Chapter 32, sec. 2". Newadvent.org. Retrieved 24 November 2014. ^ a b Froom 1950, p. 251. ^ "Against Heresies Book 5 Chapter 33, sec. 3". Newadvent.org. Retrieved 24 November 2014. ^ Froom 1950, p. 252. Froom, LeRoy (1950). The Prophetic Faith of our Fathers (DjVu and PDF). 1. Review and Herald Publishing Association. Coxe, Arthur Cleveland, ed. (1885). The Ante-Nicene Fathers. Buffalo, NY: The Christian Literature Company. Schaff, Philip (1980). History of the Christian Church: Ante-Nicene Christianity, A.D. 100–325. Grand Rapids, Mich: Wm. Eerdmans. ISBN 0-8028-8047-9.